6pm- Welcome Celebration- (Fire Pit) Enjoy a special signature Peruvian cocktail by the fire. For your entertainment, local musicians and dancers will perform a private "Petalos" show. 8am - 9:15am- Good Morning Stretch- (Studio) A gentle all levels yoga class to ease your body into the day. In this class we will incorporate breathing and meditation techniques to keep our minds present and connected to the movements of our physical bodies. 9:30am - 10:45am- All Levels Flow- (Studio) This all levels vinyasa practice is appropriate for everyone. We will move slow. Modifications will be offered for beginners and gentle practitioners. Challenges will also be offered for those looking for a something more from their mat time. 11:00am - 11:30am- Chakra Talk- (Garden) Join us in the garden as we chat about the energy systems that our practice is based on. Learn why you feel so good after your practice and why it sometimes stirs up unexpected emotions. Learn about the power that you hold within and how to tap into these systems to create balance in your every day life. 1pm- Traditional Stone Pizza Lunch & Show- (Wayra) This is a real treat. Pizza cooked in a large clay oven and a Peruvian Paso Horse Show. Bring your camera. This is a one of a kind experience. 5pm- Vibrational Energy Cleaning- (Garden) We are honored to have the opportunity to meet a very special local healer who will perform an energy clearing on each retreat guest. 10:00am - Day trip to Ollantaytambo- This cool little town has so much to offer. The town square is a gathering place for the local community. There are several cafes that offer local cuisine, coffee and tea. You can spend the day shopping at the market or pay a small fee to visit an Inca archeological site. Up for a hike? There is another Inka site, but at a much higher elevation. 7pm Music Therapy- After a full day of exploring, we will return to the Inn for a therapy session using music and healing sounds to move negative energy out to create new space for something new. 9:30am - 10:45am- All Levels Flow- (Studio) This all levels vinyasa practice is appropriate for everyone. We will move slow. Modifications will be offered for beginners and gentle practitioners. Challenges will be also be offered for those looking for a something more from their mat time. 11:00am - 11:30am- Chakra Meditation- (Garden) Join us in the garden as we work to find balance root to crown. We will use the seed mantras of each energy center to clear emotional scarring and draw in new, positive energy. Free Time- Enjoy an afternoon of rest or adventure! Spend the day relaxing in the garden or sign up for an excursion. 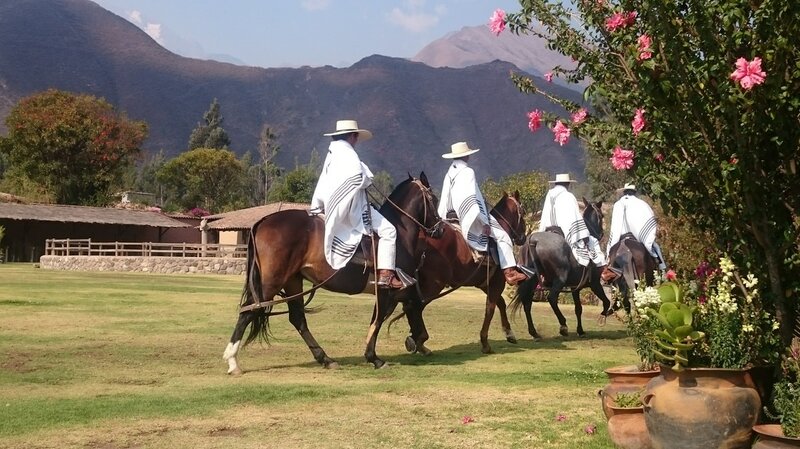 The horseback ride along the Urubamba river is highly recommended. If you want a great work out sign up for the bike tour along the river. These river tours will introduce you to a whole new world in the Sacred Valley. The views are breathtaking. 11:00am - 11:30am- Guided Meditation- (Garden) Sit or lay in the garden and allow your mind and body to rest. The peace and calm of this space makes it easy to fall to a meditative state. Travel Day- See you next year!